When it comes to making low-low budget chiller/horror flicks, the found footage format has become the avenue of choice (no need for high quality and expensive cameras, dolly’s, Steadicams, professional lighting or music, and cuts can be rough and shoddy to match the hand-held camera and emulate a naturalistic shooting style). But, what is essential to make it even remotely watchable is a good story and believably natural acting. The story has promise and bit of a twist is thrown in, but unfortunately the actors hardly ever come across as ‘real people’, but rather non-pro actors, making this footage ‘release by the police investigation’ feel far too staged than they’d anticipated. So, what’s it about? A Star Trek geek school kid decides to devise a prank by which he can humiliate and exact vengeance on the bully who’d been tormenting him all their school lives. He ropes in his reluctant friends (all with their own varied issues), and videotapes the entire process – until things turn bloody and even deadly. 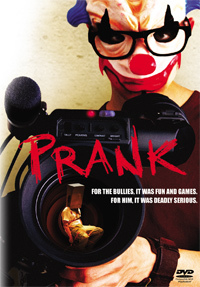 With many faults, some that average viewers won’t really care about, Prank is watchable enough, but far from being on a par with other more innovative and believable installments in this genre. Those who’d been the victim of bullies may want to see it to feel a sense of vindication (if) the bullies get it, but they may be disappointed with the pay-off – And, does violence beget violence and is it really a solution?